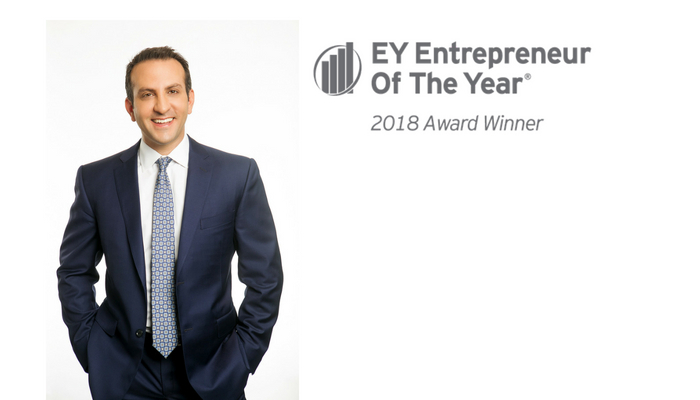 ORANGE, Calif. (July 26, 2018) – EY today announced that Reza Jahangiri, Chief Executive Officer of American Advisors Group (AAG), received the Entrepreneur Of The Year® 2018 Award in the financial services category in Orange County. The award recognizes entrepreneurs who are excelling in areas such as innovation, financial performance and personal commitment to their businesses and communities. Jahangiri was selected by an independent panel of judges, and the award was presented at a special gala event at the Monarch Beach Resort on June 22. Early on, Jahangiri saw the potential of the reverse mortgage as a retirement planning tool for older Americans. In 2004, he launched and quickly grew AAG into the largest reverse mortgage lender in the nation. Today, AAG has more than 1,200 employees and greater than $280 million in annual revenue. Jahangiri is now leading the company’s transformation from the leading reverse mortgage platform into a home equity solutions company focused solely on seniors. The transition involves moving from a monoline business into one that is product-agnostic and solutions focused, and puts AAG into a new market category on its own. AAG recognizes that seniors in America are facing a retirement crisis, with half experiencing a decrease in their standard of living at retirement, according to the National Retirement Risk Index. AAG’s transformation furthers its commitment to helping retirees bridge the gap between their income and expenses. By offering a full suite of home equity solutions, from its core reverse mortgage products to home equity lines of credit, cash-out refinance, and real estate services for buying and selling homes, AAG will be able to help more seniors achieve better financial outcomes in retirement. Another important part of AAG’s purpose-driven culture is corporate citizenship. Jahangiri created the AAG Foundation in 2015 to help those in need and encourage the company’s workforce to make a difference. For example, AAG employees use their Volunteer Time Off to make Meals on Wheels deliveries and help with Emergency Food Assistance Programs for seniors. 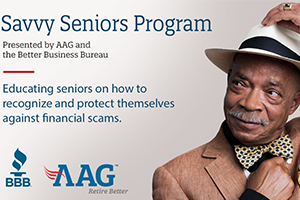 The company also sponsors the local Better Business Bureau (BBB)’s Savvy Seniors program aimed at protecting seniors from marketplace scams. The AAG Foundation also supports Willow International, a nonprofit organization focused on preventing, rescuing and providing restorative aftercare to victims of human trafficking in Uganda. Jahangiri serves as the chair of the Willow board. Since 1986, EY has honored entrepreneurs whose ingenuity, spirit of innovation and discipline have driven their companies’ success, transformed their industries and made a positive impact on their communities. Now in its 32nd year, the program has honored the inspirational leadership of such entrepreneurs as Howard Schultz of Starbucks Corporation, Pierre Omidyar of eBay, Reid Hoffman and Jeff Weiner of LinkedIn, and many more. 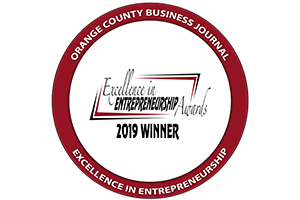 As an Orange County award winner, Jahangiri is now eligible for consideration for the Entrepreneur Of The Year 2018 National Awards. Award winners in several national categories, as well as the Entrepreneur Of The Year National Overall Award winner, will be announced at the Entrepreneur Of The Year National Awards gala in Palm Springs, California, on November 10, 2018. The awards are the culminating event of the Strategic Growth Forum®, the nation’s most prestigious gathering of high-growth, market-leading companies. Founded and produced by EY, the Entrepreneur Of The Year Awards are nationally sponsored in the U.S. by SAP America, the Kauffman Foundation and Merrill Corporation. In the Orange County region, sponsors also include Stradling Yocca Carlson & Rauth, Hollencrest Capital Management, Lockton Companies,Tangram Company and Woodruff‑Sawyer & Company. AAG is dedicated to helping older Americans find new ways to fund a better retirement through the responsible use of home equity. As the nation’s leader in reverse mortgage lending, AAG offers a suite of home equity solutions – including federally-insured Home Equity Conversion Mortgages, traditional and proprietary mortgages, and real estate services – that are designed to give seniors a better financial outcome in retirement. AAG is a proud member of the National Reverse Mortgage Lenders Association (NRMLA). To learn more about AAG and reverse mortgage loans, please visit the company’s website at www.aag.com. For AAG media inquiries, please contact: pr@aag.com.